Disclosure: I was given a PDF copy of the book to read in exchange for my review...and I'm super stoked that Marcus' book is in print as of today! There are some things that are so thrilling to me that I can hardly breathe because I get so excited. This review is one of them. I've been honored to review a lot of authors over time. I've even met some really famous authors and even had lunch with a few of them after book signings. I even go to church with a famous author. 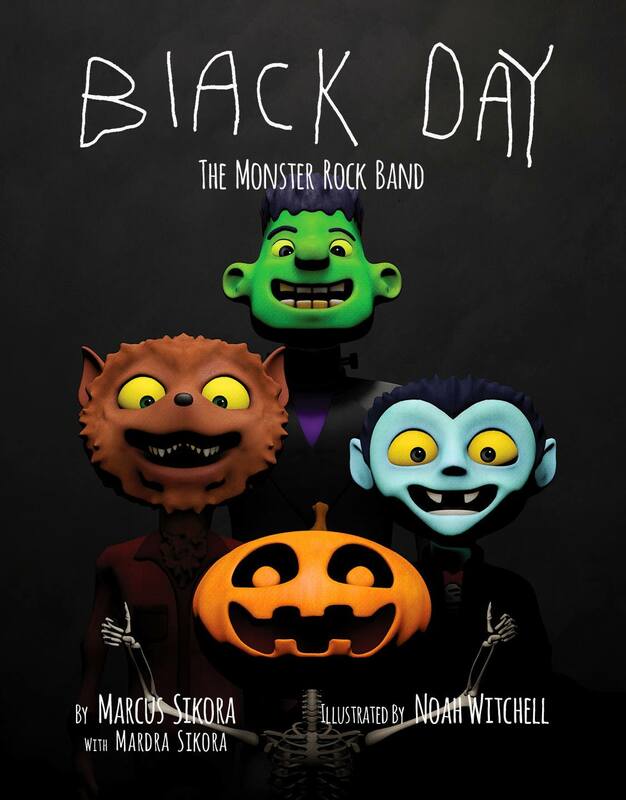 Even with all the author blessings I have in my life, to hold in my hands and read the book Black Day: The Monster rock band holds extra special joy for me because of who the author is. Congratulations, Marcus Sikora. Another dream of yours has come true today! And to Mardra Sikora, co-author and mom to Marcus, wowza! Mardra and I have been BFF's since high school and my husband and I hold the honor of being the first babysitters for Marcus. 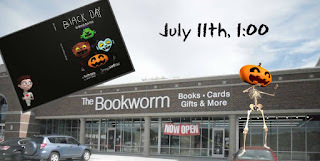 So when I see the Black Day books and hold one in my hand, I cry because he's my boy, too. Marcus is an incredibly funny guy with imagination that never ends. He gives some of the best hugs on the planet. He is an actor and singer as well as a writer. Oh, and he happens to have a spare chromosome. He's got 3 of #21 which means he has Down syndrome. But I never want that to be what defines him--he's Marcus, he's awesome, and he's a published author. The other label is meaningless to anyone who knows him. We are not big Halloween fans in our house--but the idea of monsters seeming scary and needing to neutralize the 'scary monster thoughts' makes this book perfect. It gives monsters voice to show they aren't mean or scary. 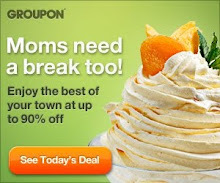 They just want to have fun like the rest of us. They want friends and to be able to make a band if they want. 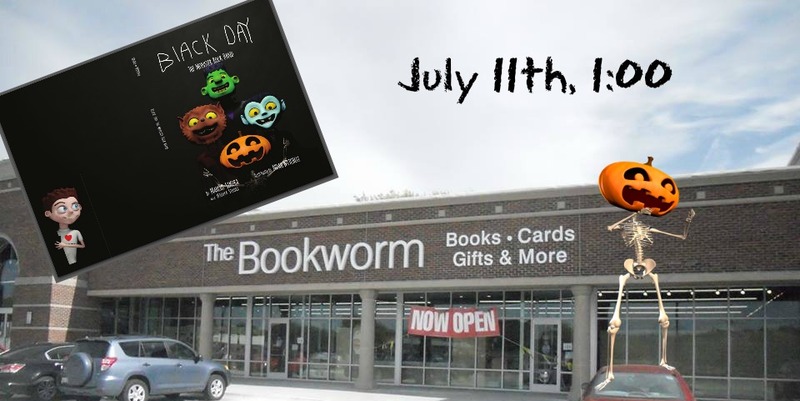 So if you're a Halloween lover, you will love the book. If you're like me and one the fence about the whole day, you'll still love the book. And let me leave you with a little bit more about the author. 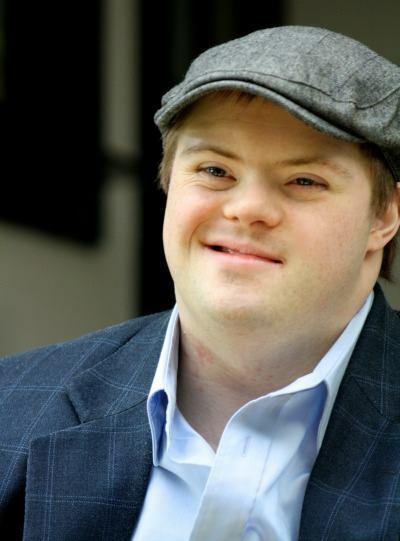 Marcus Sikora is a 25 year old creative soul who has Down syndrome and lives in Omaha, Nebraska. He has acted on stage with local and national companies as well as written a short one act. 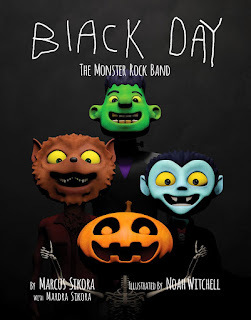 Black Day: The monster rock band is his first book for children. When he’s not watching theater, singing, or working out, he’s contemplating the sequel, title yet to be determined. You can connect with Marcus and his adventures via Twitter @marcusmusical, on Facebook at GrownUpsAndDowns, and BlackDayBook.com. Make sure you get yourself a copy of this book!